Long, long ago in a data center far, far away, there was one choice for storage. Spinning media hard disks were the only option for fast storage, high-capacity storage, and anything in between. In that time, let’s just call it BSSD (Before Solid State Disk) there were only two ways to get more IOPs out of a system: use a higher-RPM hard drive, or use more hard drives. Unfortunately, both of these strategies were limited by cost and performance. 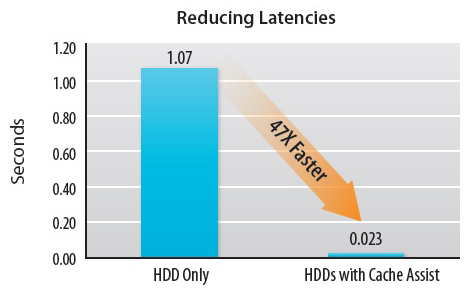 When SSDs arrived, the promise of 10x, 20x, even 30x better performance was thrilling. But the astronomical price per gigabyte meant that most users still chose spinning disk. Since then, prices have come down on SSDs, making them more attractive for those who want extreme performance on smaller datasets, but most applications that require high capacity still use spinning media because of the higher price of SSD deployments. LSI designed Nytro MegaRAID from the ground up, raising the bar on functionality by integrating RAID, caching, and flash capabilities into a single controller. Nytro takes regular MegaRAID and adds intelligent caching algorithms to assist the HDD array by identifying hot spots, and promoting them to faster on-board flash storage, reducing system latency – in some cases, by up to 47x. This sophisticated read-write caching software algorithm is ideal for addressing a wide variety of I/O bottlenecks in the data center, or the cloud. The newest Nytro MegaRAID models feature 200GB and 800GB of on-board flash capacity to scale-up application acceleration performance with a larger cache footprint. These Nytro cards feature models with either internal or external ports so, in addition to attaching internal storage, systems can also be expanded externally with up to 128 devices per port. This enables a single head node to access huge storage capacities with all the advantages of the Nytro caching technology. Obviously, we are very amped on Nytro and think it is a great technology. But how does it integrate into the Pogo Linux server line-up? Almost every one of our servers can be upgraded with a Nytro card to increase performance. Especially on the 2U-4U storage servers, this makes perfect sense when using a lot of high-capacity disks. Performance is greatly increased with the inherent SSD caching, but users still get all the large cap storage they need. Faster Performance – Nytro MegaRAID caches frequently accessed storage locations onto the embedded SandForce flash device, enabling the controller to deliver response times 100 times faster than spinning HDDs alone. This extends your hardware investments by making application storage more economical, and also allows high-performance access during HDD rebuild times (degraded mode), when requests come from flash storage. 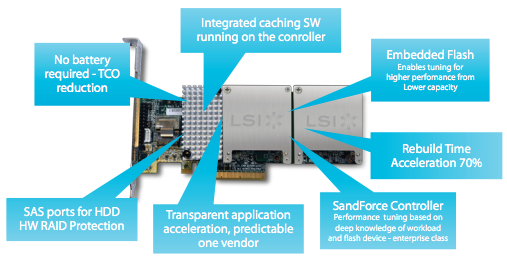 Smarter Computing – Similar to the MegaRAID card, LSI’s leading dual-core RAID-on-Chip (ROC) technology performs the usual RAID tasks and cache management on the Nytro MegaRAID. However, during Nytro MegaRAID operation, the flash storage starts to fill with frequently accessed data which can be immediately retrieved from flash storage – instead of the slower HDDs. Check out the Iris 426-24 and Iris 426-36 for perfect examples of storage servers that take full advantage of everything Nytro MegaRAID has to offer. Configure a Nytro MegaRAID application acceleration server online today, or give us a call at (888) 828-POGO to speak with a knowledgeable sales advisor. This entry was posted in Rackmount Servers and tagged Application Acceleration, LSI, Nytro MegaRAID. Bookmark the permalink.